Mayor Stubbs the cat has has held his government position since President Clinton was in office. 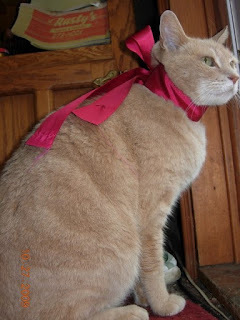 The feline was elected mayor in 1997, reports KTTU.com, when the citizens of the small Alaskan town of Talkeetna, Alaska didn't like their choices and nominated Stubbs. He won! You can visit the short-tailed Stubbs at Nagley's General Store his mayoral residence at the base of Mt. McKinley. Many tourists come especially to pay tribute to the furry politician. You can also show your support for the mayor by visiting Stubb's Facebook page. If you liked the story about Mayor Stubbs you'll enjoy Stray Cat's Rise to Mayor, the story of Freddy, the feline mayor of Sharon, Wisconsin. Congrats to Stubbs!!! I would vote for Stubbs any time! Congrats to Stubbs. Have a great Monday. Huh. It's no surprise to US that felines rule better than any hoomin, any day. It is as it should be! Concats to Stubbs! Kittehs are way better bosses than humans.